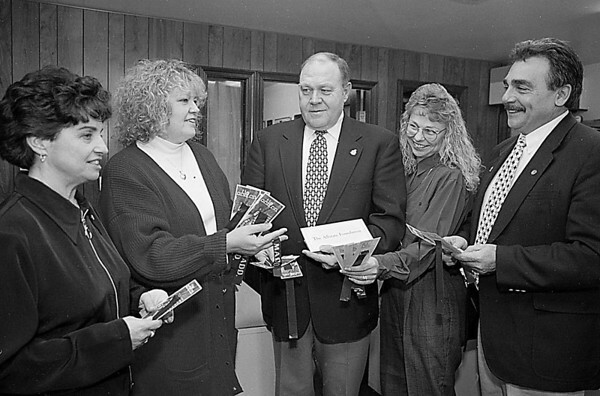 1/16/97--ALLSTATE/MADD $3000--CAPPY PHOTO--(LTOR)CO-COORIDINATORS MARY INCORVIA AND LUANNE ZUCCARI TALK WITH ALLSTATE SR ACCOUNT AGENT VICTOR FRONK JR., OFFICE MNG. KIM JEFFREE AND SR ACCOUNT MNG. JOE CANZONERI, ABOUT THE $3000.00 DONATION TO MADD.